No newspaper entries could be found. The clip of the end of Johnny Dollar that appears at the beginning of some of the episodes of Suspense have been helpful to John Abbott as he recently finished an update to the three-volume (marvelous) work on the series. It will be released soon, with lots of updates to the episode summaries, various tweaks here and there that improve the original. The Dollar series did not get much newspaper coverage, usually because editors of the TV-radio pages dismissed it as formulaic. Suspense could be different every week, and highlighting it became a higher editorial priority. 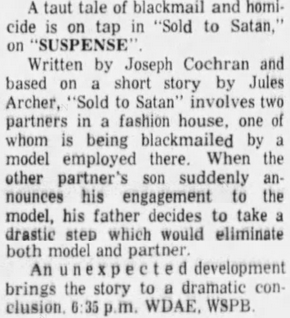 It's funny how some Suspense episodes in this era get zero mention in the papers, and for some reason this one was picked up more often. I have no clue why this one appeared a week late! Evie Juster and Larry Haines were at the first radio convention I ever went to, the 1976 OTR convention in Meriden, Connecticut. This was the first convention after the previous SAVE conventions "collapsed" (Society of American Vintage radio Enthusiasts). This 1976 one was the first in two years, if I'm remembering correctly. It was twice in Meriden before moving to Bridgeport in 1978 until 1981 or 1982. It was initially a one-day event in '76. It wasn’t even “Friends of Old Time Radio” yet. But among those early guests was Evie Juster. One of the things Evie's specialties at that time for commercials and even some TV shows: she could imitate the sound of a baby crying better and more predictably than babies on stage or on the set, or even recordings! I won't be able to post for the next few days because of a happy family occasion. So here's a few shows to fill in for my absence. There are a couple of versions of this episode with slightly different openings. The other one starts with "And now, another tale..." I'm not sure why. 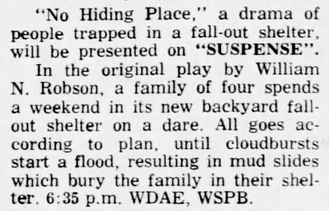 One reason could be that Suspense continued to be fed to stations for the year or so when the original productions went off the air, and perhaps those were re-edited for reasons unknown. There are a few in the collection that are this way. Rosemary Rice became an OTR fan favorite at the Cincinnati and FOTR conventions. 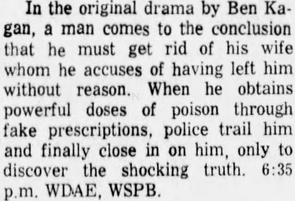 There were no newspaper highlights located for this episode. 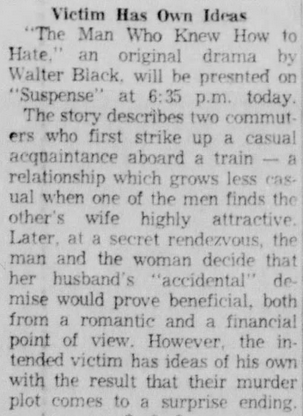 I love this first description which could fit nearly all Suspense stories and practically every drama ever written: "An unexpected development brings the story to a dramatic conclusion." HA! That's as good as one I saw many years ago in a newspaper listing for a Hogan's Heroes repeat episode: "Hogan tricks Klink." !! There is a typo in the file name that I need to change. It should be "Jimsey Somers." She was a child actor on Broadway in the 1940s, and appeared on radio now and then. She was active in 1950s television. The last entry for her in IMDB is 1961, when she was 24, so this program appears to be in the final year of her professional career. I found a publicity shot of her here [You must be registered and logged in to see this link.] when she appeared on TV's Peter Gunn. At her age, her casting for this episode makes sense. 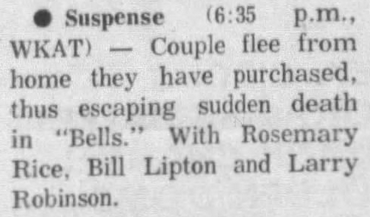 The last credit of any kind I can find for her in newspaper searches happens to be for radio, and is for 1965 in the Theater Five episode "A Little Knowledge." Glad to hear that it's a Happy family occasion this time. Thanks for posting in such trying times, Greybelt. This is an interesting recording because it has the end of Johnny Dollar, but also because it has the report of Roger Maris’ 61st home run. Thank you greybelt and congratulations regarding your son! Congratulations are definitely in order on such a happy occasion. "Greybelt the Younger" has a good ring to it. Does he also share in the same habits of his father and find that old radio shows need painstakingly complete and accurate cataloging? Thanks all... his near-obsessive-compulsive interests are focused elsewhere but he has helped his old man many times in the OTR efforts. Today's episode has no newspaper mentions. There are 21 more upgrades/diff versions to go -- I never expected to upgrade the back end of the series this much, so it's a pleasant surprise from an underappreciated period of the series. When these are done we start at the beginning of the series once more -- some nice upgrades there, too, with about 35 in that group so far. That takes us to around the US July 4 holiday. When those are done I have a handful of Whistler and YTJD upgrades. Looking forward to the YTJD and Whistler upgrades.